Wildlife ranching, otherwise known as game breeding, is a relatively new industry having taken off in 1991 with the promulgation of the Game Theft Act which allowed private ownership of game, so long as it was adequately enclosed or fenced. Prior to 1991, all game or wild animals were res nullius, meaning that they belonged to no-one, effectively to the state. Further impetus was given to the industry in 1994 when the new Constitution of South Africa enshrined the concept of “sustainable use” of the environment. Over the ensuing 25 years, an industry, unique to South Africa (and Namibia), has sprung up occupying 20m ha (20%) of South Africa’s marginal agricultural land. Today there are almost 20 million head of game on private ranches in South Africa – in comparison there are 14 million heads of cattle in South Africa. The State, including both National and Provincial parks conserves only 6 million ha, on which are found only about 5 to 6 million game animals. Prior to 1991 very few wild animals were found outside parks, a process which began with the arrival of settlers and their guns, their domestic stock, their fences and their diseases. Game animals were seen first as a source of food for the settlers and then later as competition for grazing for domestic stock. Veterinary Service campaigns to control diseases that settlers brought to Africa such as rinderpest, tuberculosis, brucellosis, together with African diseases like foot and mouth disease and nagana, that threatened the well-being of domestic livestock, led to millions of game animals being slaughtered. Today there are four economic pillars to wildlife ranching. 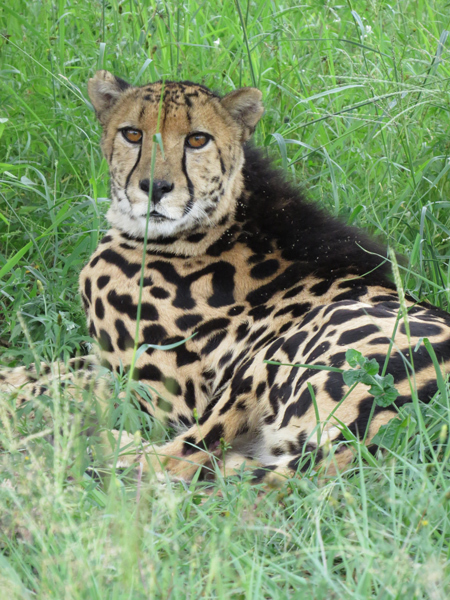 These are the breeding of animals for sale to stock other, often new, ranches, photographic tourism, wildlife products such as curios and game meat and hunting, including both local ‘biltong’ hunting and, mainly foreign, trophy hunting. Together these four pillars annually contribute more than R20 billion to the GDP of the country with hunting being responsible currently for about R7,3 billion (R6, 3 billion local hunters and R1 billion foreign hunters). These hunters provide almost 150,000 tons of game meat for consumption in South Africa, a massive contribution to food security considering that we import about R4 billion worth of meat annually. 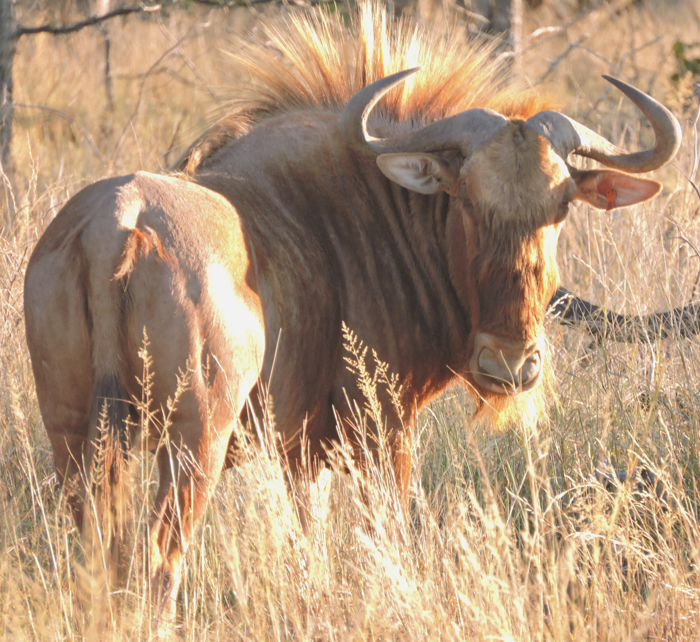 Breeding and sales of game animals contributes almost R5 billion. In the year 2000 the breeding of rare species and rare animals of different colours, catapulted the wildlife industry into a new league. Game ranchers began with the obvious at the time: rhinoceros, both black and white, bontebok, blesbuck, Cape mountain zebra, black wildebeest, sable antelope, roan and many more. 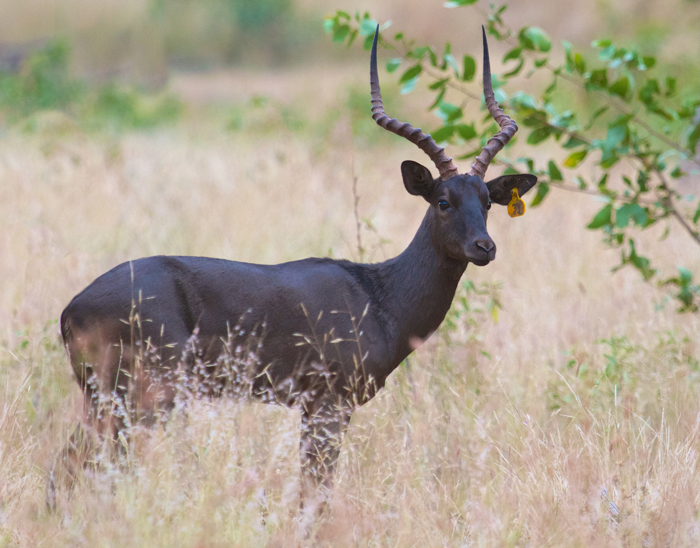 Game breeders have started to breed naturally occurring colour morphs such as the golden wildebeest, black impala, golden oryx, black, yellow and coffee springbuck, and many more. Since colour morphs generally occur from specific areas and are not common, they, command very high prices – up to 7 million for a white flanked impala. The first colour morph animal recorded in South African history was a golden oryx which was shot in 1906 and thought thereafter to be extinct. 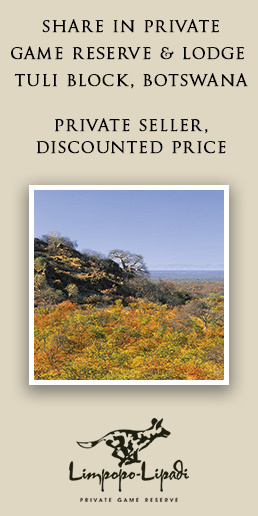 Golden wildebeest have been seen naturally in nature in southern Botswana for decades. Seeing these golden animals as a shimmer silhouette against the rising or setting sun is a sight never to be forgotten. Both black and white impala have been seen occurring naturally in the Kruger National Park and recorded as long ago as 1974. 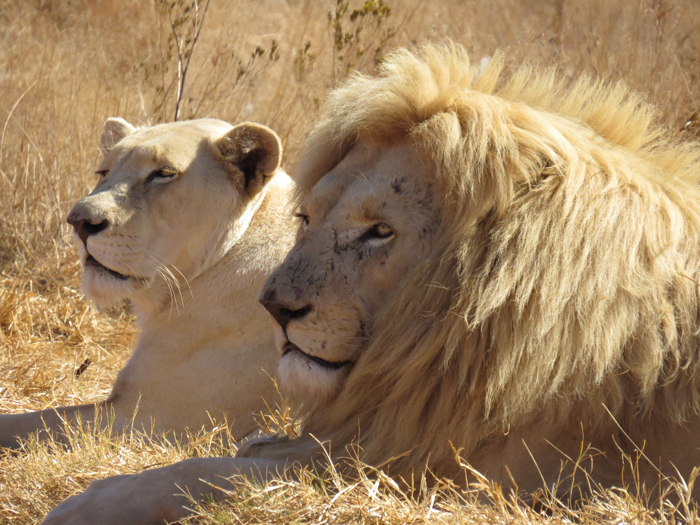 The decades old naturally occurring Timbavati white lion, de Wildt’s king Cheetah and the Nylsvlei yellow crimson-breasted shrike populations have become major tourist attractions. These differently coloured animals are uncommon, because they are generally the product of recessive genes and have no positive selective pressures acting on the gene pool. Should current conditions change so might the selective pressures on animals, hence changing the most frequently occurring colour phenotype. Unpredictable changes in local environment have sometimes led to the natural selection of low frequency colour morphs such as black rock pocket mice after black volcanic larva solidified and provided a differently coloured environment, peppered moths ‘changing’ colour (twice) in response to industrial pollution in Britain and black jaguars in South America to their needing, probably due to human persecution, to become more nocturnal. South Africa has not been well endowed with the basic necessities (generally we have comparatively low and erratic rainfall, high evaporation and shallow and poor soils and many serious diseases and parasites) to compete in the fields of conventional agriculture and so the wildlife ranching industry is a competitive edge. With the sustainable use of our indigenous game animals, we have not only better adapted animals and animals which utilise all the vegetation strata but also animals which are rare in the world and which are a huge tourist attraction. It is up to us to see the opportunities for the country’s economy, for decent jobs, for food security and for conservation and the restoration of our biodiversity and to support it. The fantastic business opportunities that such a dynamic industry offers, like any other such industry, also attract those who are in it for a quick buck. 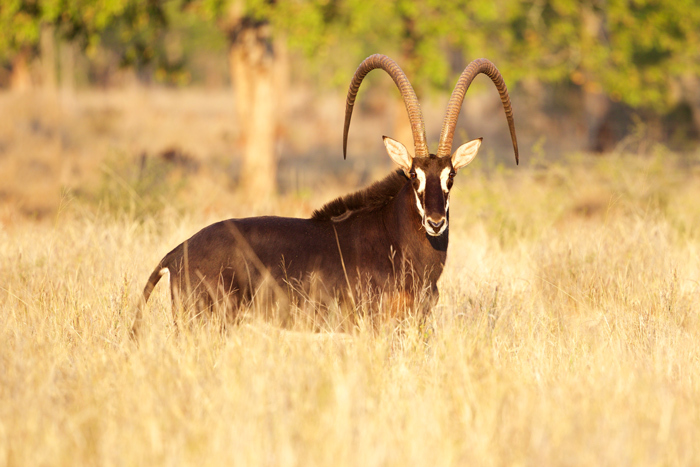 The recent attempted cases of smuggling of sable antelope is an example of this. Some are also against the intensification of the breeding of these very valuable animals as there are concerns about possible inbreeding. The intensification which entails the use of camps of approximately 50 ha similarly may limit the biodiversity benefits of a conversion to game ranching. It is therefore important that game ranchers, and their industry association (WRSA) be aware of these possible negative effects and ensure that policies are put in place to mitigate against the possible negative consequences.